2017 was the inaugural year of the Studio Outside Internship Project. Four interns, Ann Mai, Vanessa Ngo, Chandler Nyp and Lu Rui Yao, explored ways to activate spaces under the I-345 freeway that are currently dark, dangerous and difficult to navigate. They designed and discovered ways to turn these underpasses into usable public space. This year we explored something different in Deep Ellum: alleys. 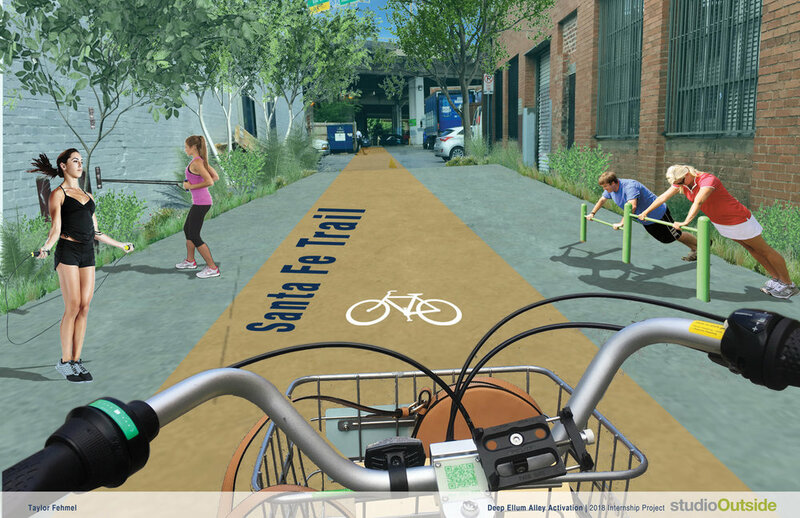 Throughout this week we discovered the traditional uses of alleys and how design can transform them into eclectic, active public spaces. The four interns this year are Taylor Fehmel (Louisiana State University), Lilian Kao (Texas A&M University), Giannis Koutsou (Iowa State University), and Emilee Voigt (Kansas State University). Together, the four of us worked out of our comfort zones and designed a space that was “right up our alley”. We moved our computers and coffee mugs into the largest conference room at Studio Outside, and Intern Week officially began. For the next five days, this would be our home as we embarked on this special project. We kicked off the project with a tour of the existing alleys of Oak Cliff, Downtown, and Deep Ellum. Led by Outsiders Gwen McGinn and Isaac Cohen, our tour began in Oak Cliff, observing alleys that are mainly used for passageways to other roads and service corridors. 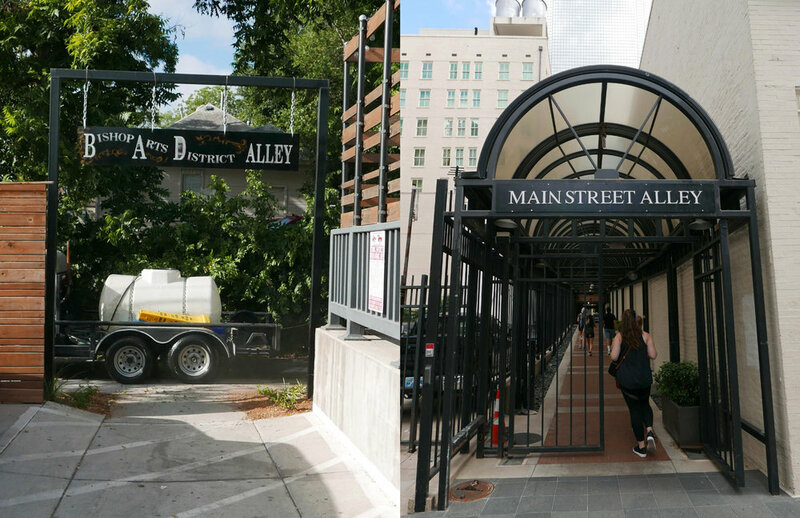 Next, we made our way to Downtown Dallas and visited alleys that had been transformed into usable spaces. 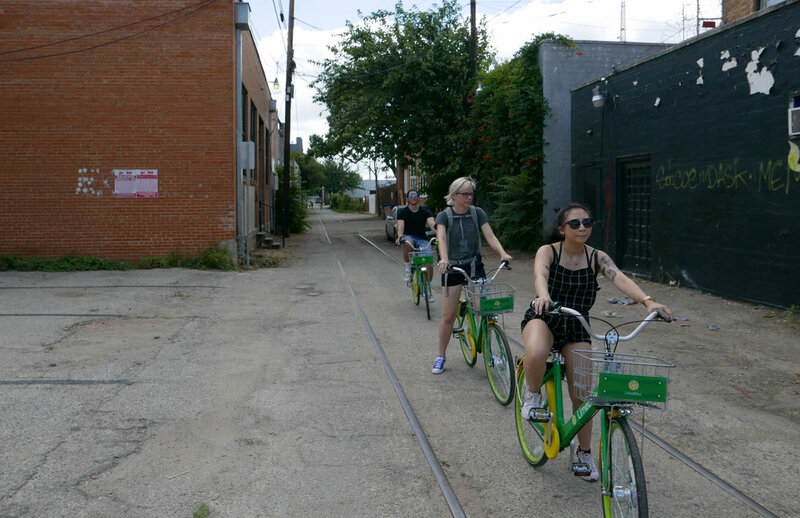 In our final stretch, we rented bikes and rode into Deep Ellum. Two particular alleys stood out to us: July Alley and Clover Street. 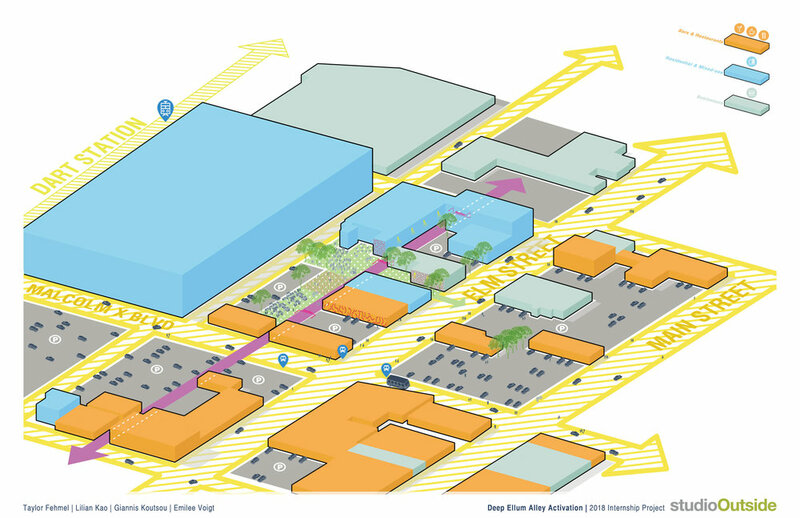 After the tour, we each chose an alley in Deep Ellum to explore through individual design proposals. The task was simple: in one day, create your ideal alley. What happens there? What does it mean to you? The following Monday morning, we presented our ideas to the office, the Trust for Public Land, and the Deep Ellum Foundation. We realized that all four of us had chosen the same alley. We each saw exciting opportunities and potential on Clover Street and we each proposed a very different, unique idea. As we entered the group phase of the project, I knew we were in for a good time. Four different backgrounds, four different creative personalities and four different people. We come from four different universities where we know how our cohorts work and understood their strengths. That’s what made this phase exciting: the unknown. Instead of continuing our study of Clover Street, we switched directions and chose July Alley, the alley north of Elm Street with a connection to the DART Station. It posed an interesting challenge for us because it isn’t a stereotypical alley. Most of the alley is surrounded by open parking lots, not buildings that create edges. As we focused in, we realized that we weren’t only designing an alley but the adjacent spaces as well. Rolls of trace paper later, we narrowed our focus and flexibility is ultimately what drove our design. Flexibility, for us, means spaces that are adaptable, welcoming of all age groups, and a place that maintains the creative energy of Deep Ellum. 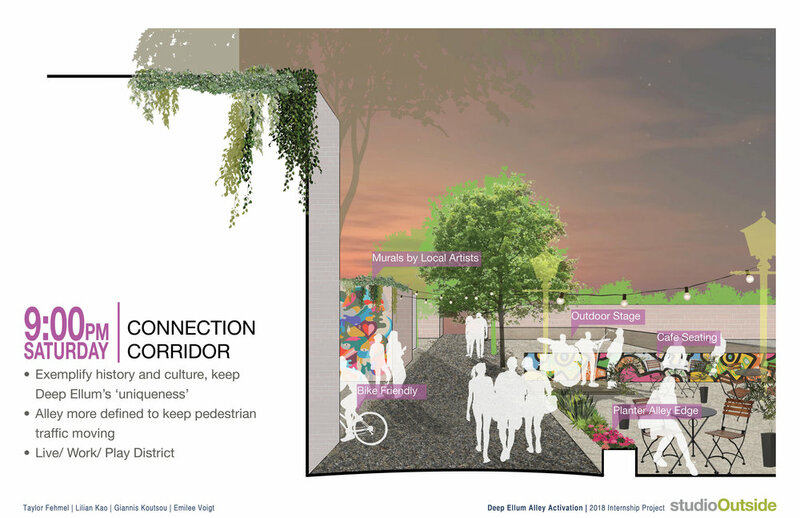 In an effort to communicate how these flexible spaces function, we designed individual moments throughout the alley and showcased them at different times of day. 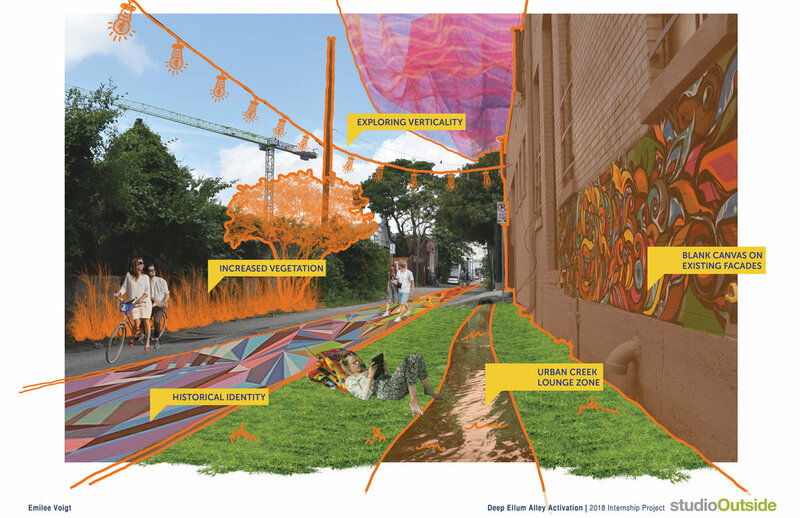 We dove into ideas and typologies that could be implemented in July Alley and explained how those ideas could be applied in other alleys around Deep Ellum. As the project came to an end, we had a better appreciation for our different educational backgrounds and who we are as students, designers and people. This was an incredible experience and we are extremely grateful for this amazing opportunity from Studio Outside.